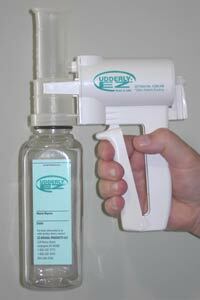 The safest and most effective milk and colostrum collection device available. The hand-held trigger-operated pump snaps on a flanged plastic extraction cylinder. The Mare Milker comes packaged with two sizes of extraction cylinders. The #1 Small extraction cylinder accommodates small or maiden mares, sheep and goats. The #2 large extraction cylinder is for older or larger mares, miniature cattle and larger exotic animals. The extraction cylinders have been specially designed to fit the unique shape of a mare's udder and have a rolled surface to prevent harm to the udder. One hand operation is gentle on the mare, making it safe and easy to milk colostrum. Great for milking mastitis mares. Ideal for foals who inherit a different blood type than the dam and are at risk for neonatal isoerythrolysis. Patented pump is manufactured with the highest quality engineered composite materials. The Mare Milker comes packaged with two 16 oz. 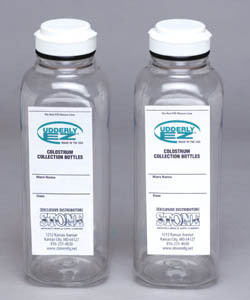 colostrum collection bottles. name and colostrum collection date. Cap has leak proof liner seal. Packaged two 16 oz. bottles per carton or 12 bottles per case.